Join Wild Boomer Women for our Holiday Party! We are taking a 3 hour tour to see the Holiday Lights!! 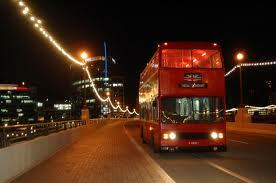 The Real London Bus Company will be picking us up at Tempe Marketplace in front of the Ross Store. There will be music, Laughter, Surprises and Food and you can BYOB (if you are drinking please come with a designated driver)!! We are serving sandwiches, chips, cookies, hot chocolate and water. Feel free to bring anything else to drink or eat - no glass please. We will start boarding the buses at 5:45 and leave promptly at 6pm so get there in enough time - don't miss the bus. Bus will return at 9pm. DRESS TO WIN: We will be giving out prizes for the best costumes - what that means is dress in your holiday festivities - with a Wild Boomer Women twist. The most creative and fun costumes will win fabulous prizes. CARPOOL: If you want to carpool, please respond to the post I have put on the discussion board on the website (log in to the website at www.wildboomerwomen.com with your user name and password, then click on the members tab, members only and discussion board). This is going to be FABULOUS PARTY!! Cost is $32 per person, this includes 3 hour light tour, food, music, surprises and lots of fun! !